Why not give people something they can really use? Our great selection of carabiner and other customized flashlights are perfect for anyone who easy access to a flashlight. A promotional carabiner flashlight personalized with your custom imprint can be hooked to a bag, belt or just about anything. Long lasting and very useful and it will provide years of very positive promotion of your imprinted message. 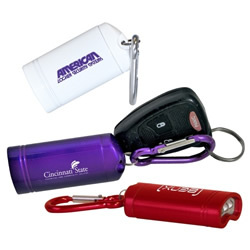 Custom imprinted carabiner flashlights from Heritage Advertising are an excellent promotional value. Give us a call (706-374-0710) to put our years of promotional and advertising experience to work for you.We can help you select the best promotional flashlight ot other promotional tool to help you get the best value for your advertising budget. Free quotes and friendly customer service. Great for housewives, moms, dads, kids, scouts, hikers, technicians and general fieldwork. Convenient carabiner clips onto bags, belt loops and key rings. Pull flashlight from magnetic cap to activate the 3 LED lights. Carabiner allows you to clip it to an item to keep it handy. Comes with two CR2032 replaceable batteries. Available in three metallic body color options: purple, red, white, royal blue. Assorted colors per order require minimum of 50 per color and imprint color must stay the same on all. Product size is 1-1/4" wide x 2-1/2" long x 5/8" high. Imprint area is 1-1/2" wide x 1/2" high.